Have our expert designers build your custom website! No website? No problem! At Online Orders Now our team of expert website designers will create a unique web presence to encourage customers to order from your restaurant online or dine in person. 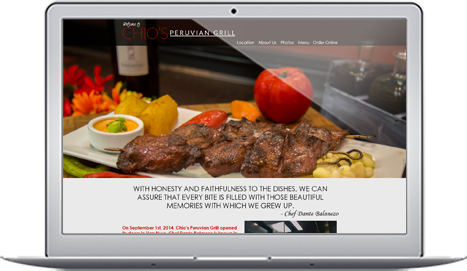 Our restaurant website designs are crafted with great care to present a sharp and effective message that will earn a spot in browser favorites! Image Slider: A few of your favorite images will rotate to visitors as soon as your site loads. Use photos of your great food, restaurant interior, employees, guests, etc. to tease out a taste of your unique dining experience. Social Networking Links: We will help your website visitors find your Twitter, Facebook, Yelp, Foursquare, and other social media accounts by embedding prominent, easy to spot links. Contact Form: Customer feedback is vital for any business to succeed. Not only will your restaurant phone number be clearly visible, but a contact form is also provided that sends you an email when visitors share their questions or comments. Google Map: An integrated Google Map is much more useful than just giving out an address. Customers using mobile devices can even get directions with a few simple clicks. Embedded Videos: We will show off your great YouTube or Vimeo videos by embedding them right into your website. Search Engine Optimization: Your website is only useful if customers can find it. Our SEO experts will employ the latest search engine optimization strategies to push your site to the top! Call us today at 813-549-7010 and speak with one of our sales associates to start setting up your custom website today. You can also use the contact form by clicking the button below.